WHERE: I completed this piece of work in my summer placement at Supremo, a digital agency. WHAT: I took ownership of the ‘Creative Cup’, an event Supremo hosts annually, twitter account. The Creative Cup is a charity football match for digital agencies in Manchester. 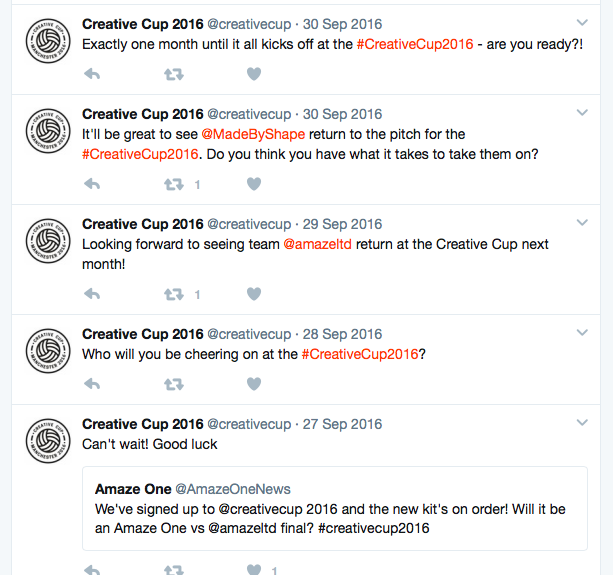 WHY: The task was to encourage people to sign up to the Creative Cup, as well as to encourage them to engage with the social media accounts and share their opinions. To do this we used pictures from past events, sent out woven badges to attach to football kits and followed numerous different agencies on Twitter. There were also a lot of tweets that encouraged different agencies to interact with each other. Technical – As I was only contracted to work two days a week, I used Hootsuite to schedule the main tweets and then managed incoming tweets as they came in. I also used Twitter Analytics in order to research and judge the approaches that were most effective for the brief. Communication – I encouraged different agencies to interact with each other by releasing the fixtures slowly and rousing interest. As a part of this project management task, I also had to approach different agency directors over email and telephone to invite them to be a part of the event. This project was made easier by the things I learned in the Writing for Communications module. Not only did it help with writing engaging tweets, but allowed me to approach agency owners over email in an appropriate and professional manner. A successful event with over 15 teams from different agencies around Manchester signing up to play. Hundreds of pounds raised for charity. You can view the Twitter stream here.